Named the Most Valuable Player of the National Junior College Division II basketball tournament, Marlena Williams of champion Illinois Central College is a co-Tri County Female Athlete of the Year. A former Manual High School athlete and sister of former Manual star Frank Williams, honored this year as Male Athlete of the Year, Marlena was also the top vote getter for the NJCAA all-regional team for Region XXIV and the Region XXIV all-tournament team. 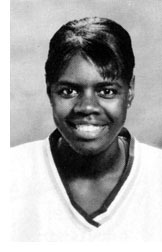 She averaged 21 points and 10 rebounds in the national tournament, played in Hagerstown, Md. Marlena dominated the national tournament. She scored 27 points and had 10 rebounds to pull out a first round win over Kirkwood, 70-69; had 18 points and seven rebounds against Calhoun College of Decatur in a 81-70 semi-final win and then scored 18 points with 12 rebounds to overpower Penn Valley of Kansas City, 72-65. Averaging only 24 minutes per game in the regular season because many games were won by lopsided scores, Williams still averaged 14 points, shot 49 percent and played outstanding defense. "Statistics do not tell the true story of Marlena," said coach Lorene Ramsey. "Marlena is a great clutch player capable of carrying an entire team, yet she is also an unselfish player." Born in Peoria in 1904, Allyn Stout broke into the majors with the St. Louis Cardinals in 1931. Although he posted a 6-0 record in 30 pitching appearances in his rookie season, arm trouble prevented him from participating in the 1931 World Series against the Philadelphia Athletics. Well-respected by his teammates, however, Stout was voted a full share of the World Series bonus pay and he was presented a World Series ring. Stout went on to a 6-year career with St. Louis, Cincinnati, New York and Boston, appearing in 180 games with a 20-20 record and 4.54 ERA.